Last minute shopping? (isn't that a given?) Last minute gift wrapping? Here are a few ideas to use things you may have or easy things that will give your gifts a little more personal feel. Although this could look a little more festive, I'm happy to share this little idea with you to give your Christmas gifts a little homemade feel. 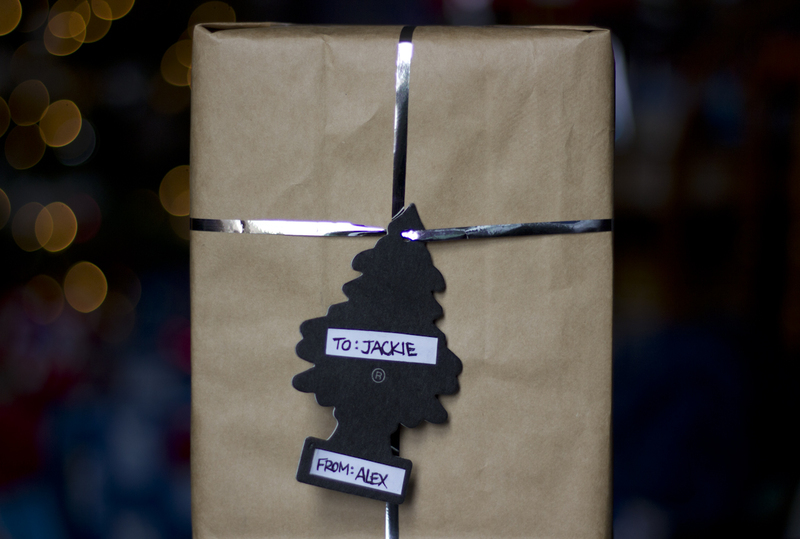 I've had a few of these "Christmas tree air-fresheners" in my car that have long-since lost much of their scent & i thought what better way than to use them as gift tags! I took a blank mailing label and cut it to size to cover the original labels. 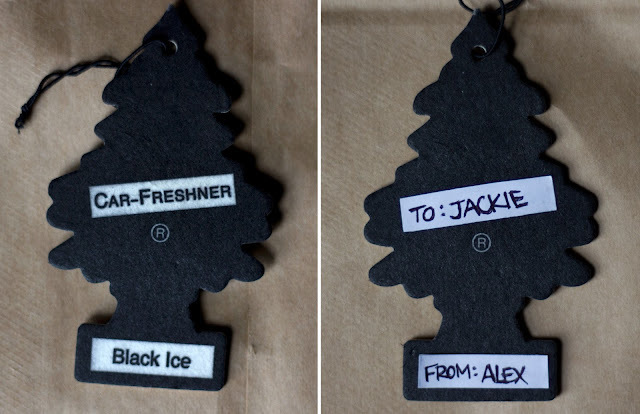 I never get anything other than the Black Ice scent but using the evergreen/pine ones would be more festive and along w/ looking nice it'll smell nice, too! 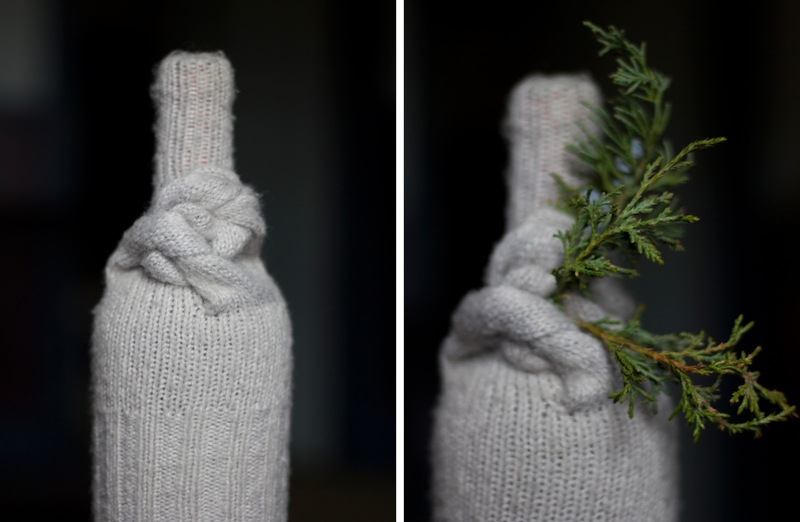 It's always almost impossible to disguise a wine bottle--they're usually just sitting in a gift basket or have a ribbon tied around their necks. 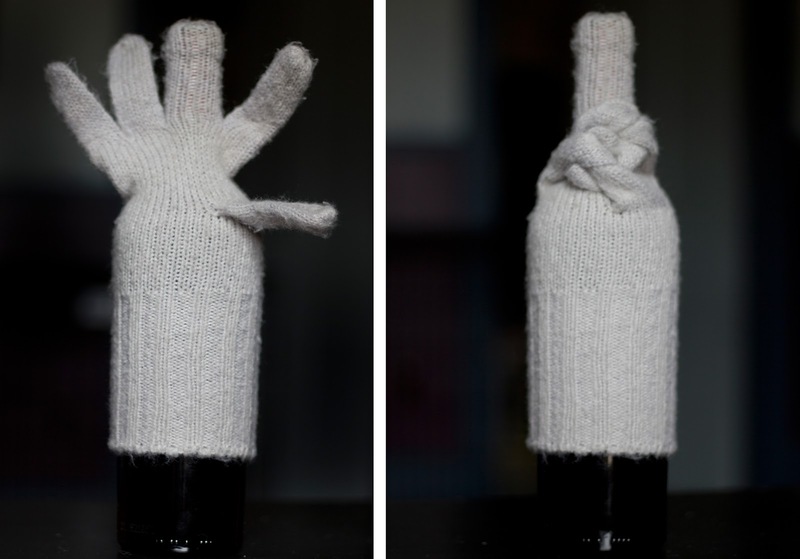 For this I took an old cable knit glove (you could also get new ones to include w/ the gift) and put the "middle finger"of the glove over the top of the bottle. I then tied together the thumb and pinky and then the ring and index to create a braided/rosette look. To make it more festive I ran outside and snagged a few sprigs off our cedar trees and added them to the bunch. voila! This one is the simplest, and maybe the cutest. 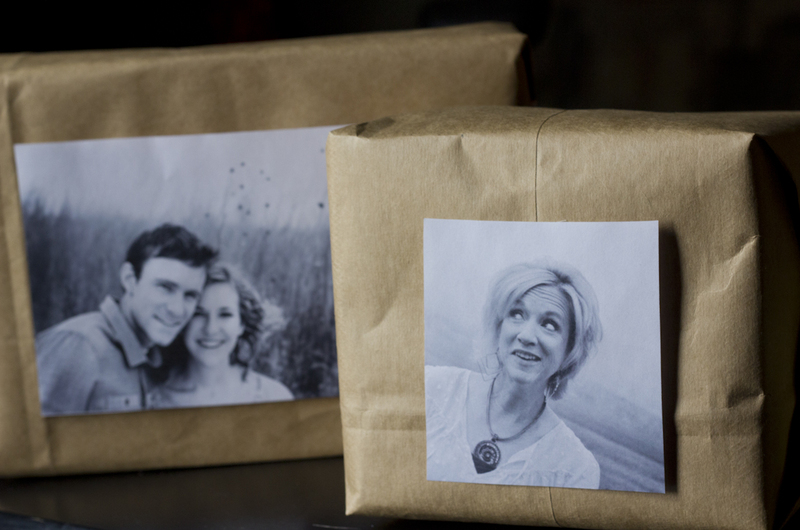 Instead of using boring stickers or tags to identity who the gift is for...use a picture of them! To unify, I decided to make my images black and white. This can be a great way to bring up family memories and events by including old family photos. Be creative-- cross out and circle people in group photos, or be specific and cover up everyone but the person getting the gift with bows!